UNICEF says it is fighting "one of the worst ever" outbreaks of cholera in West and Central Africa that has made over 85,000 people sick and killed 2,466 people so far this year. The magnitude of the outbreaks mean this part of the world is facing one of the most devastating epidemics in its history, the United Nations agency added. CFRs (case fatality rates) are alarmingly high, UNICEF warned, ranging from 2.3% to 4.7% in many areas, and possibly up to 22% in some parts of Cameroon. Young children are especially susceptible to cholera complications because they dehydrate more rapidly than adults - those at most risk are malnourished children. This year, Cameroon, western Democratic Republic of Congo (DCR), and Chad have had the highest increases in cholera incidence. "In addition there are still challenges with getting access, ensuring staff presence in medical facilities and establishing surveillance systems to monitor cases and numbers in parts of North-East DRC." Lake Tanganyika - where Burindi and DRC meet. UNICEF is supplying desperately needed treatment kits, carrying out community education campaigns on hygiene, as well as assisting with epidemiological surveys to try to make sure control efforts are optimally targeted. Authorities can play a major role in saving lives in this emergency, UNICEF stressed. Many lives can be saved and the disease controlled if there is effective information exchange between cross-border districts on the number of cases and population movements. Inspections across borders for chlorination and disinfection can also save lives and keep the disease under control. It is important that the governments in the affected areas coordinate the response and preparation both within their own borders and in collaboration with their neighbors. Multi-level cross-border coordination is crucial, UNICEF emphasized - from national to district levels. In 2010, UNICEF initiated a cross-border epidemiological study which covered the Lake Basin, where Niger, Nigeria, Chad and Cameroon borders are located. This study is now in its second phase. "The study provides critical evidence for informing cholera prevention and response interventions, which have to be coordinated across borders. Cross-border coordination between teams in Kinshasa and Brazzaville has also been initiated for the more recent cholera outbreak in the West Congo Basin." 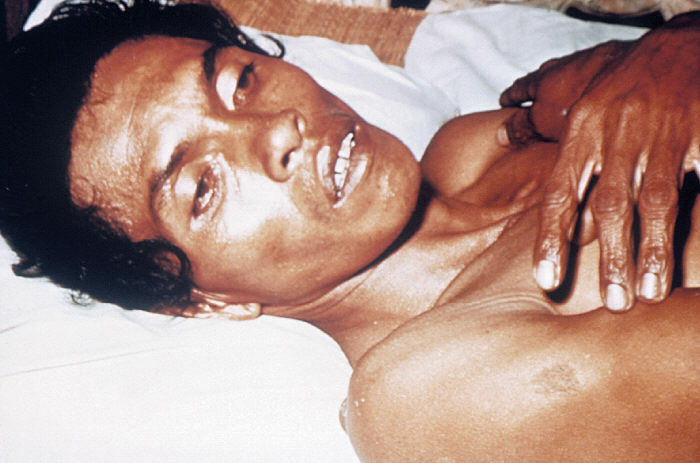 Cholera "is an acute epidemic infectious disease caused by the bacterium Vibrio cholerae. A soluble toxin elaborated in the intestinal tract by the bacterium activates the adenylate cylase of the mucosa, causing active secretion of an isotonic fluid resulting in profuse watery diarrhea, extreme loss of fluid and electrolytes, and dehydration and collapse, but no gross morphologic change in the intestinal mucosa." The majority of cholera infections are not, in fact, severe. Approximately 75% of infected individuals show no symptoms. If signs and symptoms do appear, they will do so within 6 hours to five days of exposure. In severe cases the patient can have explosive watery diarrhea, sometimes referred to as rice water stools because it looks like water that has been used to wash rice. There is also vomiting and leg cramps. Fluid loss can be severe and rapid, with some patients losing up to 20 liters per day - in such cases there is a serious risk of severe dehydration and shock. Signs of dehydration may include an accelerated heart beat, low blood pressure, rapid weight loss, sunken eyes, and a loss of skin plasticity. Shock occurs when the circulatory system collapses. The bacterium which causes cholera, Vibrio cholera, is not endemic to humans. Its presence in the human digestive system is not a natural part of its life cycle. Vibrio cholera is typically found, for example, in estuaries, and during its life cycle it shifts between various reservoir species, such as crustaceans, small snails, free-floating planktonic forms, and static forms resident in the silt of the estuary. The bacterium most commonly enters the human ecosystem through contaminated food or water, such as insufficiently cooked seafood from estuaries, or poorly cleaned vegetables irrigated by tainted water sources. A single infected human can contaminate all the water for an entire population if sanitation is poor. Cholera is a disease that affects poor areas where basic sanitation and hygiene are inadequate. Nordqvist, Christian. "Over 2,400 Cholera Deaths In West And Central Africa." Medical News Today. MediLexicon, Intl., 11 Oct. 2011. Web.